Valentine's Day surprise giveaway everyday through Feb 14th, 2013. 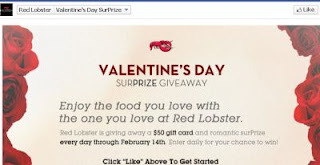 Enter to win a free $50 gift card & a romantic surprise from Red Lobster. Click the link below to go to Facebook like them to enter the giveaway.